Not much battery power left; I used it all up this morning trying to send that update and making some adjustments to the blog. So we’ll see how long it lasts. Hopefully I’ll be able to recharge tomorrow, or else there will be no blogging. I promised myself I was going to try to do this in the morning so I could get some more sleep, but I’m really not sure I’ll have time. Besides, I find it strangely comforting; a close to the day. We moved out to Belle Chasse from England (I’m not sure that’s the right name, frankly) AFB today. It was...strange. We came in on I-45 to I-10, and fueled up at Baton Rouge. After that, we did not stop until we got to Belle Chasse, some four hours later (I changed driving duties with my passenger at one point when traffic was jammed up and moving slowly). It’s always interesting to drive into New Orleans on I-10, just to see the Interstate run for several miles on pylons over the swamp and ocean. But of course it was different this time. 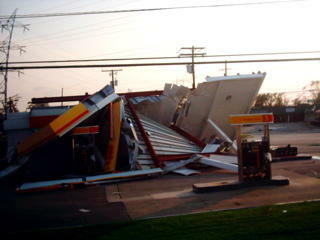 I really saw very little damage for the longest time; just the usual downed road signs and ripped-up billboards. Then it started. First it was the railroad on the coast. It was out in several places, the embankment underneath having been washed out by the storm, with the rails just hanging unsupported. I-10 was indeed closed past US-61, but the police were doing a poor job managing traffic. There was a sign several miles earlier saying “Emergency vehicles only in left lane,” but what’s an emergency vehicle? Do we count, or is that only for ambulances, police cars and the like? It turned out that it was meant for us, because all non-relief vehicles had to exit. But since we didn’t know that, we didn’t get over, and so got involved in a major snarl. Besides that, the civilian cars chose to completely ignore what lane they should be in, and decided to try to pass us on the left. Eventually the police up front (they had a little shelter tent on the side of the Interstate) had us go around on the right margin, and then we made it smoothly past the roadblock. New Orleans is trashed. At first it was little things, like Mcdonald’s signs without any plastic in them, or roofs with many shingles missing, and leaning electric poles. Then as we drove southeast on US 90 it was entire roofs missing, electric poles broken in two, and billboards and gas station shelters crumpled into heaps of metal—but all the glass on the buildings was intact, even if the roof was gone or caved in. Finally, even the glass gave way, and parts of walls were missing, electric fixtures hanging down—completely trashed. But nowhere were entire buildings demolished that I saw. Nor did I see any flooding where we were. It would have been absolutely terrifying to have been there when all that damage was done. The rumors of no cell service are exaggerated; I don’t have service here through Cingular, but some Verizon customers do. Occasionally, anyway. And I had signal not too far out of the gate of this place. But the news has been saying that they’ve been working on it, so perhaps this is a recent development. Things improved on the approach to the Air Station; the damage wasn’t so bad near the coast. So here we are, sitting on a really long, old, disused...runway, it has to be. We can hear planes and helicopters overhead and taking off all night so far. It’s not really what you’d picture when you think of a runway: A long black strip with jets parked on or near it surrounded by lights and close-cut grass. This place isn’t like that at all. This is really old asphalt patched in certain places with crumbling concrete. The asphalt is cut into huge squares, kind of like sidewalks are, but with like 4 squares across and a zillion up and down the runway. They’re surrounded by woody, briar-filled marshland. Not everyone went straight to Belle Chasse; 2nd Platoon had a mission to rescue survivors, as I mentioned (except, like I said, for a few of us who had to haul baggage). Apparently that mission was a bust; they got there too late and the State Police wouldn’t send the mission out for fear it wouldn’t make it back until after dark. Or something. I wasn’t clear on the details. Days activated: 7. Lives saved: 0. Things have been pretty messed up here; we never did get dinner, though nearly all of us had extra MRE’s and ate them if we were hungry. No one really knows what’s going on yet. They seem to be having difficulty with coordination and organization at higher; we got told many different plans in a very short amount of time. Sometimes you wish they would just sit down and hash things out with everyone before they told us to do something. But I’m sure that that’s exactly what they do, and all these changes come from unforeseen things happening. No tents tonight; we’re sleeping in the beds of our trucks or on the ground. Most of us have cots if we want them. RUMOR: We saw the President flying overhead. We did indeed see a really nice Jolly Green Giant Navy helicopter fly overhead, painted green (most Navy helicopters, including Jolly Green Giants, are grey). Later someone said that they heard that that was the President. Wonder if it was true? It was certainly some big-wig’s aircraft. Hm. I’m sleepy and out of battery power, so I guess it’s bedtime.